Early in May, The Hebridean Trust covered the cost of a visit by a group of disadvantaged young people from London in order to give them the opportunity to stay at the Hynish Centre and to enjoy the challenges of the fantastic range of outdoor activities that Tiree has to offer. The group, from the School Engagement Programme (S.E.P) at Golborne Youth Centre in West London, started their journey early on Wednesday 4th May at Heathrow airport. There was real excitement as two members of the group had never flown before and this was the first time away from home for many of them. Their flights were paid for by a benefactor who wishes to remain anonymous. The cost of the stay at the Hynish Centre and the programme of activities was funded by The Hebridean Trust as part of the Trust’s commitment to disadvantaged young people. Those who attend the S.E.P. (3-5 days a week) are disengaged from a formal learning environment. These youngsters find it difficult to become motivated and complete set work or to contribute to overall learning. On the programme they are given one to one support, additional support with core subjects and personal development classes. When the group landed at Tiree airport they were dismayed to discover that there was no service on their mobile phones and, even worse, the girls found there was not a Top Shop in sight! 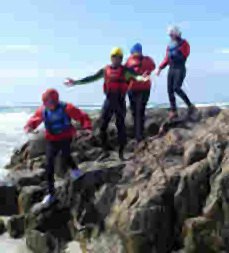 However, they soon settled in at Alan Stevenson House and spent the next week taking part in activities including surfing, rock climbing, abseiling and coasteering, being transported around the various island locations by Nancy MacKechnie. One evening they headed off for an overnight camp. Unfortunately the wind got up and they had to return to the house, but not before they got to grips with cooking their dinner on a camp fire. The majority of these young people do not enjoy an active lifestyle at home so the whole experience took them outside their comfort zone. They found the activities tiring but by persevering they managed to overcome some of their fears and started working together as a team . An Tirisdeach met up with them one evening towards the end of their stay and asked them about the experience and if they felt they had gained anything through their visit to Tiree. They all agreed that the time had made them work more as a group, they had found out about each others strengths, weaknesses and some surprising phobias! A lot of them had missed their families and had realised how little they did for themselves at home. All the group enjoyed staying at Alan Stevenson House and commented on the lovely food and how nice Monica and Lesley are. They found the lack of street lights, pavements and crowds strange and although they had adjusted to no mobile phone reception or shops they were looking forward to their return to London. They also said that, if they had not been missing their families, they would have liked to stay longer.